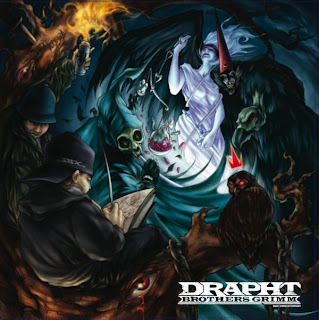 Brothers Grimm is the 3rd album from West Australian MC Drapht. Reminiscent of Q-tip with a hypnotic flow as effortless as Grand Puba, he possesses one of the most unique voices in Australian Hip Hop. Drapht could easily rest on his style alone but this new album presents an artist replete with substance. The passion and vigour on this album are a testament to Drapht's unwavering commitment to Australian Hip Hop. Following the release of his first album 'Pale Rider' at the age of 20, the 2005 release 'Who Am I' garnered widespread success on triple j and community radio nationwide. With three seminal albums in five years, Drapht is clearly a force to be reckoned with. Brothers Grimm is an uplifting album destined to capture the imagination with its catchy hooks, intelligent wordplay and consistently phenomenal production. Drapht shifts effortlessly from the quirky and playful 'Where Yah From' and 'Jimmy Recard', to the frustration and grit of 'Soundman', 'Insomnia' and 'Don't Wanna Work.' The sombre, reflective tones of 'Falling' and 'Lose Control' present yet another string in the bow of this wordsmith, joined later by fellow MCs Ciecmate, Dazastah & Trials on the massive 'Rest In Peace'. Produced by Trials with guest production by world class Australian producers Plutonic Lab, M-Phazes and Simplex, Brothers Grimm charts a course through the breadth and width of modern Hip Hop.